"Neat way to make a ball shaped cake. Perfect for birthday parties. Kids love it. Use your favorite flavor of cake mix." Heat oven to 350 degrees F (175 degrees C). Grease and flour one 2 1/2 to 3-quart ovenproof bowl. Place sugar in a bowl and stir in black food color until desired color is achieved. Set aside. Prepare cake batter according to package directions. Pour batter into the prepared bowl and bake until a skewer inserted in the center comes out clean, about 1 hour and 15 minutes. Let cake cool for 15 minutes in the bowl then invert and let cake cool completely. Once cake is completely cool, trim flat side of cake and place on a cake board. Trim edges into a ball shape. Frost with the white frosting. Next, using a toothpick, draw a pentagon in the center top of the cake. Surround the pentagon with five hexagons. Repeating to cover entire cake. Cover lines with black licorice cut into 1 1/2 inch pieces. Fill the pentagon shapes with black-colored white sugar. 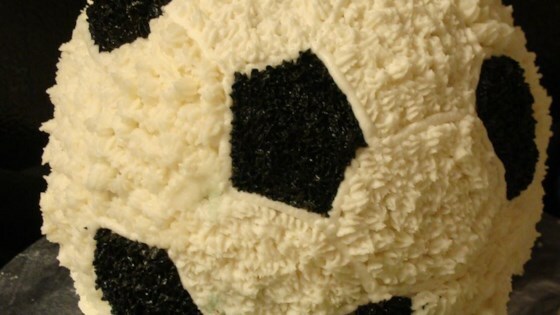 Celebrate birthdays or big games with a soccer ball cake. I have the soccer ball cake pan and it worked perfectly for my husbands scary eyeball birthday cake that my kids wanted me to make. Fun! I made this for my son, Michael's 4th birthday, and he LOVED it! Everyone was complimenting it all day. Thanks so much for the recipe. I tried it out just recently for my son!!! thanks sooo much!! Where did you come up with this idea? Have you ever made it for someone (when?) -what was the response? I made this for a friend's birthday party in a local restaurant and all the staff were amazed. Really easy to make. I used cherry laces, but it still looked good. What an exellent and innovative idea for a cake! I think I will try it.